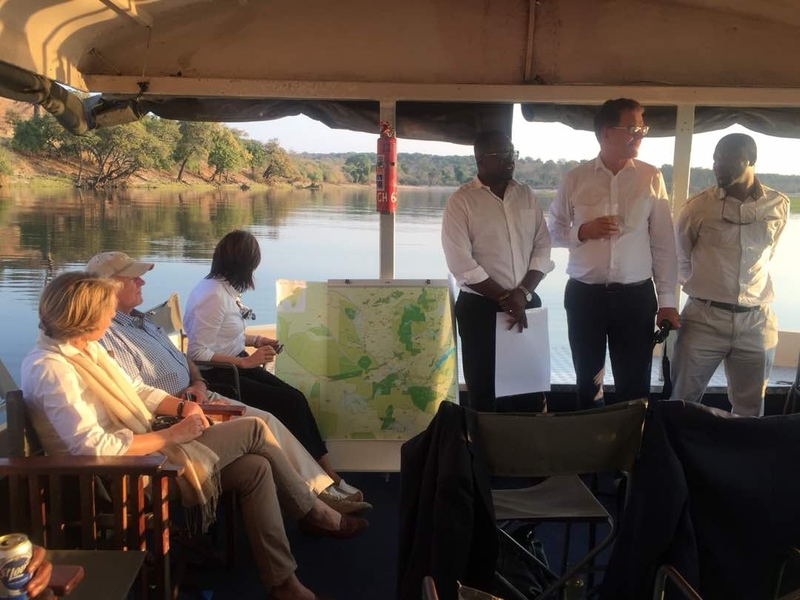 The German Minister for Economic Cooperation and Development, Dr. Gerd Müller, visited the largest terrestrial transfrontier conservation area in the world, the Kavango–Zambezi (KAZA) Transfrontier Conservation Area (TFCA) covering Angola, Botswana, Namibia, Zambia and Zimbabwe, on 27-28 August 2018 in Kasane, Botswana. Dr. Müller expressed his appreciation for the work being done in the region and iterated how stable and peaceful the area has become. 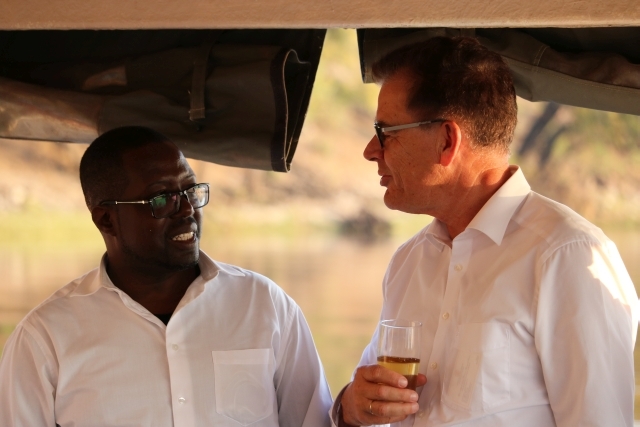 He further added that the German government is, “committed to continue providing both technical and financial support to KAZA.” In Kasane he attended a dinner hosted by the KAZA Secretariat with representatives of all the five partner states and collaborating partners such as KfW, the Deutsche Gesellschaft für Internationale Zusammenarbeit GmbH (GIZ), Peace Parks Foundation (PPF), International Union for Conservation of Nature (IUCN), World Wide Fund for Nature (WWF) and USAID VukaNow. Dr. Müller reiterated the German commitment to the region and the importance of regional peace and stability during an interview with the media in Victoria Falls town, Zimbabwe. Earlier this year, on behalf of the five partner countries, Botswana signed Phase III of funding from the Federal Republic of Germany to the amount of €15.5 million. Funding from the German government through KfW was first received in 2006 and extends German-SADC development cooperation in transboundary natural resource management and conservation, which amounts up to €126 million in total for Technical Cooperation through GIZ and financial cooperation through KfW. Dr. Nyambe Nyambe, Executive Director of KAZA stated that Phase III will put special emphasis on communities where tangible benefits can be felt. In the past, infrastructure and institutional development were the focus, but more support will now be provided to communities and conservation impact on the ground. Since its formation in 2006, KAZA has achieved major milestones. 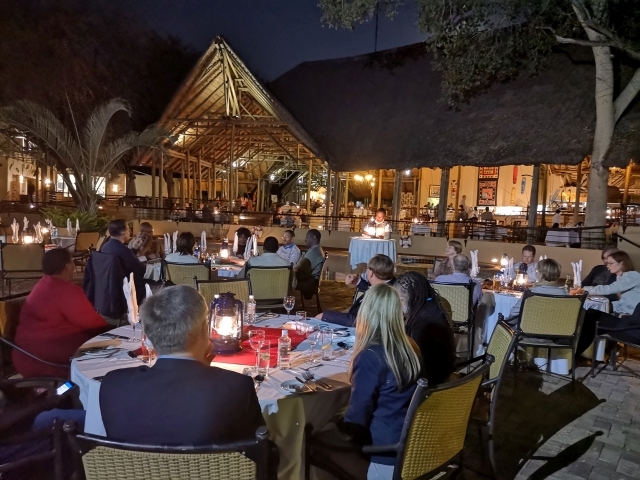 The KAZA TFCA process evolved from two initiatives namely, the Okavango Upper Zambezi International Tourism Initiative (OUZIT) and the “Four Corners” Transboundary Natural Resource Management initiative. From the institutional development by the establishment of the KAZA secretariat and various working and coalition groups, to the involvement of traditional leaders who play an active role in the crafting of solutions, implementation of program and monitoring of impacts. Since the signing of the KAZA TFCA Treaty in 2011, there has been constant support to park infrastructure development. A highlight activity was the official launch of the KAZA UNIVISA pilot project between the Republics of Zambia and Zimbabwe. KAZA continues to support community development projects as well as human-wildlife conflict mitigation measures. It should also be recognized that the KAZA brand has been able leverage funds, with various partners aligning their strategies, fundraising and implementation efforts in support of KAZA TFCA vision according to Dr. Nyambe. The continual growth and recognition of KAZA as a tourism and investment brand, will ensure that both humans and wildlife can co-exist harmoniously. Not only is peaceful co-existence possible, the work KAZA is doing will alleviate poverty in the region and be an example of a thriving ecosystem for the world where both local communities and wildlife can flourish.